Do you know this suburban twentysomething wild teenager? For the past nine months, a young Kaspar Hauser clone in Germany has been insisting he was raised in the woods for the past 5 years, knows only his first name (“Ray”), and that he buried his father (his only known relative) in an unmarked forest grave last August. Intriguing as the Forest Boy of Berlin mystery is, I suspect we’re seeing another Bush Boys of British Columbia or Piano Man story in the making. 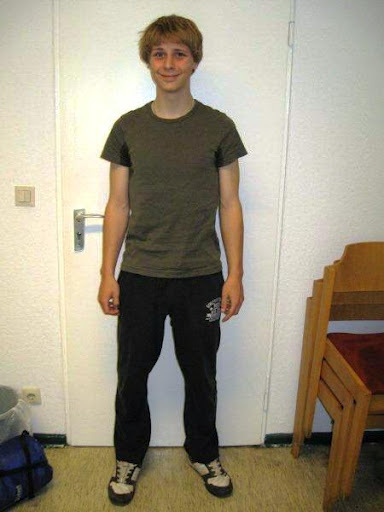 Update (June 15, 2012): Forest Boy has been identified as Robin van Helsum, a 20-year-old from the Netherlands. He disappeared from Hengelo just three days before he turned up in Berlin last September. Hey, did you know that Vice magazine and Beavis and Butthead predicted 9/11? Yeah, neither did they. Conspiranoids are pointing out that an illustration in a 1994 issue of Vice, featuring Beavis and Butthead as Al Qaeda terrorists circling the Twin Towers in little airplanes (tasteful as hell, right? ), is a classic example of “predictive programming”. That’s when bad guys tell you exactly what they’re going to do to you before they do it because their ancient, heathen religion demands a willing victim (you know, like Cabin in the Woods). The problem with this brilliant theory is, the issue was actually a mock-up of a 1994 magazine to commemorate Vice‘s 15th anniversary – written, illustrated, and printed in 2009. If you’ve read part VI of the Fake Teens series , or followed the incredibly bizarre story of the teen boy who manipulated an online buddy into trying to kill him, or even just watched Dateline, then you know that online romances with teenagers can end messily. A young woman in Novia Scotia is now facing up to the consequences of her fake online identity after her pseudocide possibly contributed to a real suicide. Last month, the Skeptoid podcast did a nice piece on the Rothschild banking dynasty, pointing out that the Rothschilds are still all that, but do not currently include a bag of chips. That Cabin in the Woods reference wasn’t really a spoiler. If you like horror movies, see it. In the next few days, we’ll be wrapping up the Prodigal Witch series and moving on up to Chemtrail Week. This entry was posted in 9/11, Conspiracy Theories, Fake Teens, Hoaxes, Missing People, Wednesday Weirdness Roundup and tagged hoax, predictive programming, Rothschilds. Bookmark the permalink. Welcome back! I really missed you!And yeah the whole "lets tell the people what we are going to do to them in art first" thing makes absolutely no sense to me. How people become so convinced of it just boggles my mind! It's good to be back. I really can't figure out where the notion of "predictive programming" began. The closest historical parallel I can find is supernatural lore that indicates vampires, fairies, or ghosts have to ask permission before entering a dwelling. Living where I do, I see persistent contrails all the time, so the idea of Chemtrail Week is very welcome.Also, welcome back! Another welcome back from a long-time lurker! Looking forward to the chemtrail madness. Doubtful News has an update on the story of the wild boy of Berlin:http://doubtfulnews.com/2012/06/photo-of-forest-boy-released-rays-history-is-still-a-mystery/Surprise, surprise, it was a hoax. Yes, the story of 'Ray' was on the BBC this evening. Turns out he's a twenty-something Dutchman.